JSE-listed diversified real estate investment trust Redefine Properties’ new 15 storey Rosebank Link has been completed on schedule with all its office space now fully let. The iconic building is located at 173 Oxford Road in the heart of bustling and cosmopolitan Rosebank and strategically positioned on the doorstep of the Rosebank Gautrain station. The new tower has an estimated gross lettable area of just over 18 000sqm of office space with approximately 817sqm of retail on the ground floor. WeWork, the global community company with operations in over 400 locations across 100 cities will be leasing six floors at Rosebank Link. This extends WeWork’s global presence to Africa, with Rosebank Link being its first site on the continent. WeWork’s 173 Oxford Road will become home to over 2,000 members – who will join the global WeWork community of 400,000 members – and open to all types of businesses: startups, SMEs and large enterprise companies who take up about 30% of WeWork’s global membership. “We are thrilled to announce our expansion to South Africa with Rosebank Link in Johannesburg. Not only are we entering a brand new city with plentiful opportunities for our members but expanding here is significant for our company in terms of our global expansion – Africa is the sixth continent for WeWork, so this is a very exciting moment for us. “As we continue our growth, we are also committed to sharing the upside with our landlord partners, so are especially pleased to be partnering with Redefine Properties in a revenue-share agreement that allows both parties to benefit from the revenue WeWork’s presence in the building will generate,” says Patrick Nelson, Head of Real Estate for WeWork EMEA. Some of the office tower’s prestigious new tenants also include Covington SA, Jellyfish, Value Capital and GMG. The most distinguishing feature of Rosebank Link is its proximity to the Gautrain station. At just 30 meters, the transit-oriented building is a stone’s throw away from the Gautrain Station and the Gautrain Bus Stop. The tower’s unique location allows a safe and direct access to the station through a landscaped pedestrianised thoroughfare on the ground level, running under the building. “The highly successful letting of Rosebank Link makes us extremely proud. 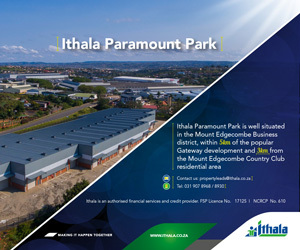 It underscores the fact that despite a challenging leasing environment, the combination of a top quality asset and unique location will always attract premium tenants,” says Pieter Strydom, Commercial Asset Manager, Redefine Properties. Rosebank features unprecedented amenities like high-performance fitness centres, restaurants, cafes and gastro-pubs, including a soon to be opened top-end Food Lovers Market. Rosebank Link’s ideal location means one can literally walk anywhere to access these amenities or transit points without the need to cross a road. “Furthermore, the demand for flexibility makes collaborative work spaces appealing to entrepreneurs, small and medium enterprise as well as agile corporates looking to stay nimble. Increasingly, a number of innovative teams at leading corporates are also moving to inspiring spaces that are fast become habitats for sharing ideas and co-creation,” adds Strydom. Rosebank Link with its expressive steel and glass clad shell provides high level of environmental control within the office space maximising available natural light and as a direct consequence reduce energy consumption. At the heart of the building is a multi-storey enclosed north facing atrium fashioned to capture the abundant sunlight filtering down to the ground floor thoroughfare. This creates a conduit for a combination of green walls and plants brought to life in executive roof gardens terraces, podium level garden terraces and parkade wall gardens that allow for a tranquil environment not normally afforded in multi-storey buildings. The building consists of two basement parking levels, with additional parking levels above ground, a ground floor public/retail level, five parkade levels and eight stories of offices above a podium level. Rosebank Link offers parking at 4.8 bays per 100sqm in line with a premium grade property. “We have delivered a building which is not only sustainable but also high on innovation and is 4 Star Green rated,” says Strydom in conclusion.